Retells in graphic novel format Shelley's classic tale in which a monster assembled by a scientist from parts of dead bodies develops a mind of his own as he learns to loathe himself and hate his creator. Completely different from what I thought I knew it to be. Wonderful read!!! This was not the book I thought it was going to be. I found it hard to put down and it really made me think. Well worth a read! I know many people that enjoyed it, but I never could get into it. I personally felt that it was rather slow and Doctor Frankenstein's thought process was a bit limited, but I may be one of few that feels that way. An interesting way to show human's pride and his evil side. Going into this book, I expected the character of Frankenstein's monster to be like the stupid, clumsy monster we have come to believe he is. I found this to be the opposite of true. 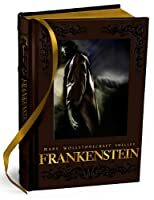 For everyone who has watched the movie and didn't give a second thought to the intelligence of Frankenstein's monster, I highly recommend this book, if only to gain a new perspective of the character. Nothing at all like any movie or TV show or other rendition of Frankenstein. The book is deep, thoughtful, inspiring, provocative, heartbreaking. It will be one you'll be pondering the rest of your life. It is a classic, but it also a lot more deep than just all the lightning and such portrayed in films. Fascinating, complex story that raises multiple questions. Who was the real villain? The creature, Dr. Frankenstein or the people? Cases can be made for any of them. I thoroughly enjoyed reading this book - it's been related to artificial intelligence and forging the gods - from this philosophical and ethical standpoint, it was amazing. It began as a round of storytelling between a group of friends around a fire. As the duty of telling a story fell to Mary Shelley, she wove a tale of science and monsters, horror and humanity. Hers was the last story told that night. The others were left terrified and unable to concoct any tales worthy of competing with Shelley's. This story was the basis for Frankenstein, which Shelley was encouraged by her friends to refine and publish. Despite what many may believe, this story is less about the rampage of Frankenstein's monster (as shown in the Universal Studios film) than it is about the monster's search for acceptance and attempts at regaining humanity. Is the true horror the monster, or the monsters that the people around him prove themselves to be? Fear of the unknown creates an atmospheric and intriguing tale that delivers on a base human level. As with many Victorian stories, this one takes a bit of work to immerse yourself in, but it is well worth the effort.